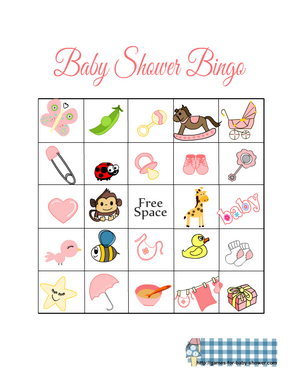 On this website I am sharing various different types of Bingo games like word bingo, gift bingo, guest bingo and on this page I am sharing Free Printable Baby Shower Picture Bingo Game in four different colors. I have made ten different bingo cards in each color and one caller's checklist. I have enclosed the bingo cards in a safe to use zip file and you can download it without any fear. I have not made a PDF file so it will be easier for you to print the selected cards only. How to Play: Download the Bingo cards in the color of your choice, extract the zip file and print the cards. Cut the images from the caller's checklist and put those in a basket or jar. Distribute the Bingo cards among the players with a pen or pencil. Draw one caller's card at a time and show it to players. Ask the players to cross the image shown on the caller's card from their bingo sheet. The person who crosses 5 images in a row either horizontally, vertically or diagonally first and yells the word 'Bingo', he or she will be declared the winner. 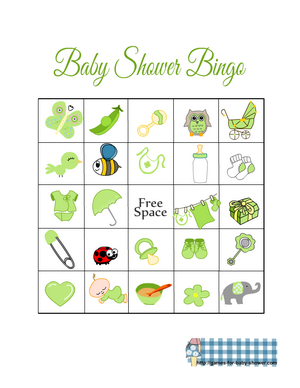 This is a set of adorable Bingo cards in green color. All the picture bingo cards are decorated with cute images like butterflies, birds, baby food, hearts and many more adorable things. Just click on the thumbnail image of the bingo card that I have shared above and the bingo file in zip format will be downloaded to your computer automatically. 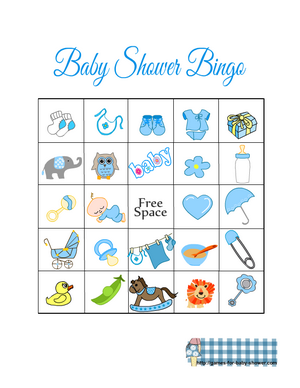 Click on the image given above to download this adorable Baby Shower Picture Bingo Game cards and caller's checklist in blue color. Each card in this bing game is different from the other. You can play this game with upto ten players. If you want to play this game with more than ten players then you will have to print duplicate cards. In case of duplicate cards, the person who completes a row and yells the word 'bingo' first will be the winner. Here is the last set of these adorable bingo cards in pink color. You can print these cards if you are having a girl baby shower. Just click on the thumbnail image that I have shared above and the zip file with all the bingo cards and caller's checklist will be downloaded to your computer.